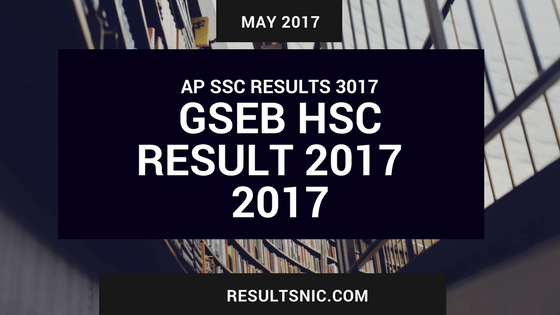 Gujarat GSEB HSC Result 2017: Gujarat Secondary And Higher Secondary Education Board (GSEB) announced 12th Class Science stream Examination results on their official website on 11th May 2017. Students can get their Higher Secondary result on the website gseb.org. Check Gujarat GSEB HSC Result 2017, Marks Sheet using the roll number wise at gseb.org and indiaresults.com. GSEB at Gujarat State conducts the 12th class Board exams of science, arts and commerce in March and April every year all over the state and outside Gujarat also. GSEB releases the result of Science, Arts and Commerce stream results on May every year. The Gujarat 12th Class exam results are now available and students can get their results by entering 6 digits seat number on the website gseb.org. Students try to give their best in the Examination in order to get good results and seats in their desired colleges/institutions for further studies. After exams, they eagerly wait for results which will be displayed on the official website www.gseb.org. Gujarat HSC Science Result 2017 is now declared. Details of the result are given below. The GSEB conducted the HSC or class 12 examination in March at various test centres all over India. A total of 17,59,225 candidates appeared for both class 10 and class 12 exams in 2017. In Class 12 Science exam, out of a total of 1, 41,370 registered candidates, 1,38,252 appeared. GSEB was established on May 1, 1960. The GSEB conducts two (including four semester type examinations) main examinations - the Secondary School Certificate (SSC) exam for class 10 and the Higher Secondary (School) Certificate (HSC) sem-1,sem-2,sem-3,sem-4,exam for class 12th students in Gujarat. The Board also holds a talent search for students of class 8 and class 9 in five major subjects every year.